Red Titan Hybrid Beet has it all—sweet flavor, outstanding color, high yields and great disease resistance. The intensely dark red beets are very uniform with no internal zoning, and its handsome green foliage shows hints of red. An ideal beet for roasting, pickling and eating fresh. For the very best, sweetest flavor and tenderness, harvest beets when they are 3 in. in diameter.This Gurney's Choice variety shows tolerance to downy and powdery mildew and is highly tolerant to cercospora leaf spot. 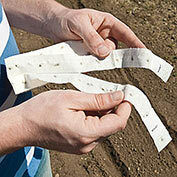 Beet seeds germinate best when they are soaked in lukewarm water for about 24 hours before sowing. Approx. 200 seeds per pkt. 60 DAYS. 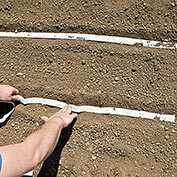 Spacing: 3 inches apart, in rows 16 inches apart. Foliage: Leaves are green with some red, 12-13 inches long. 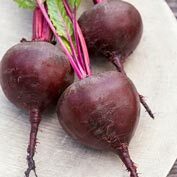 Comments: Intensely dark red beets have a delightfully sweet flavor, due to their high sugar content. Roast for a deliciously healthy side dish. 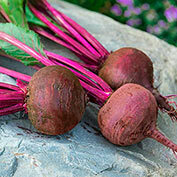 Enjoy great yields of attractive beets that are very uniform, with no internal zoning. Tall, handsome foliage, green with hints of red, has great disease resistance.